Circus training for young people is alive and well in Middletown, the self-styled circus capital of Connecticut. Starting September 12, young people ages 12 to 19 will have the opportunity to receive professional training in circus arts through a unique program with a nearly thirty-year history. Circophony meets Tuesdays and Thursdays, 6:30 to 9 pm, from September 12 through November 16. The program culminates with a “Fall Circus Showcase” on Friday, November 17, and Circophony members will then have the chance to audition for Circophony’s Spring Production. All classes take place at Oddfellows Playhouse at 128 Washington Street in Middletown. The Fall Training program is open to all teens, regardless of circus experience, who are willing to commit to the ten-week, five-hour per week program. Training will include many aspects of circus and performance, including acrobatics, tumbling, juggling & object manipulation, balancing & equilibristics, unicycling, stilting, strength & flexibility, physical comedy, clowning and ensemble performance. 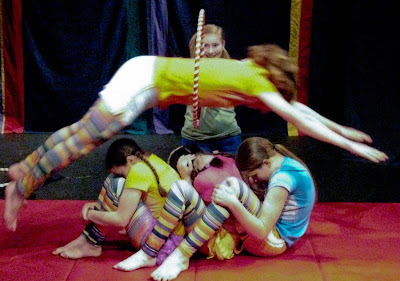 The program does not include aerial training, but Circophony members are regularly provided with opportunities to enroll in specialized workshops, take field trips to professional circus performances, and participate in Regional and National Youth Circus Festivals through the American Youth Circus Organization. Circophony is a collaboration between the Middletown-based Theater Company ARTFARM and Oddfellows Playhouse Youth Theater. The program is directed by ARTFARM Executive Director Dic Wheeler, who started the Children’s Circus of Middletown in 1988 and has been teaching, directing and performing circus and theater around the United States, Europe and South Asia since 1980. Wheeler leads the program with Assistant Director and Head Coach Allison McDermott, a life-long circus performer and a graduate of the Professional Training Program at the New England Center for Circus Arts. The two will be joined by guest artists throughout the Fall program, and will create an original Circus Theater performance with the Company which will premiere in March. Tuition for the ten-week program is $250. To enroll, go to www.oddfellows.org. For more details about the training structure and content, contact Dic Wheeler at info@art-farm.org, or visit www.art-farm.org.